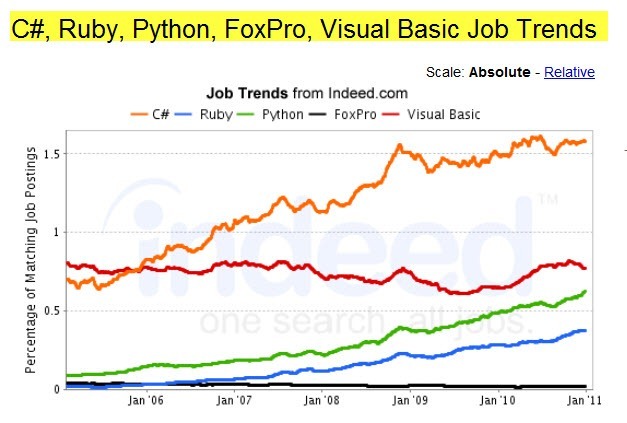 Job postings chart for some programming common languages (as of 3/24/2011). 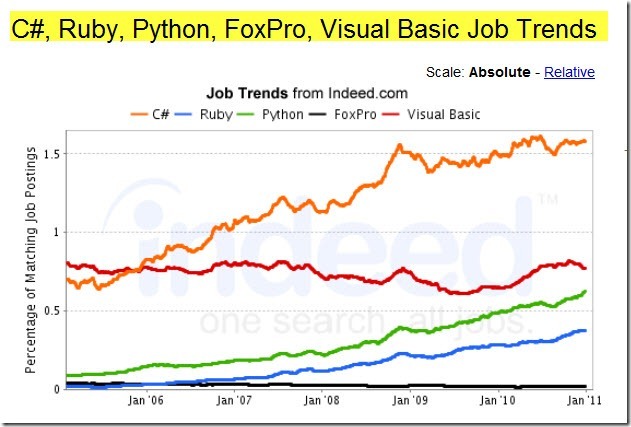 You can see that C# has about 3 times the job postings as Ruby or Python, and that that Ruby and Python are on a path to overtake Visual Basic. Darn statistics as they are called and undeniable trends I might add. Couple of things I think about with respect to statistics and trends. 1) Most FoxPro people or people looking for FoxPro people never post jobs. Jobs are found by word of mouth. For instance, I have hired three full time people and several contractors in the last few years, and I never posted a job once. People network through an established community. Others use headhunters and headhunters rarely use job posting sites from my experience. They put their links into the community as well. 2) What projects and tools used have higher needs of resources vs. what tools used by projects need more resources because of pressures of the deadlines, capability of the developers, experience of the developers, and the maturity of the tools. How does that all play out? In my personal experience and that of people I have talked to is that .NET projects are run with less experienced developers who are newer to the tools and that can impact a project by needing more developers. Plus the .NET tools are deprecating technologies fast between releases and that impacts even experienced developers by starting all over again with the replacement components. I compare that to a FoxPro project that is typically lead or handled by someone with more than a dozen years of experience both in career and the language/tool, and focused on backwards compatibility even when newer techniques were made available. Less people also needed for maintenance work vs. a greenfield project. I am not trying to say that the trends shown in the graph are not compelling if you are looking at it from a career point of view of what to do next if you are in the mode of looking for change. But, even this graph is not showing something I think is even more compelling to consider, which is where mindshare with community leaders is shifting. And that my friend is to Ruby and Rails. Watch out for shiny. It is interesting that the VFP jobs have remained unchanged since 2005. I would have expected more of a decline.